It’s been a pretty incredible sports year. I just want to use this space to thank each and every one of you for reading and supporting us in our inaugural year. There were certainly some times where it was a struggle to keep motivated but the incredible feedback made my job so much easier. Anyways, with the close of the 2017-18 school year now officially here (except for CPS, sorry guys), we though we would give out some end of season awards. There have been some incredible athletes and teams and there’s only so many awards we can give out, I promise it’s not because I hate your school. Admittedly a completely made up and ambiguous category but I had to include it just because this tweet still makes me laugh to this day. We’ve talked a lot about great fan support through the year but Maine West really was unrivalled. Yea, we can go ahead and forego any further explanation. Enjoy it again below. Nobody lost more to graduation than Evanston did last season. Nojel Eastern, Elyjah Williams, Chris Hammel, and Malcom Townsel all put their stamp on the program and with so much turnover, it was expected to be a “down” year for the Wildkits. Instead it was a ridiculously successful year which turned into a third place finish for Evanston. It’s hard to believe, but this may may have been Coach Gaters best coaching job yet. Marshall was not expected to do much last season, with less talent then they are accustomed to having. But even after a slow start to the year, Marshall broke out late to win a state championship in 2A. Henning eeks out Chrstie here by virtue of a state title. You could really see the flashes in the Griffins early season game agains Maine South, before capping off his sophomore campaign with a brilliant performance in the state title game. Henning has since picked up offers from the likes of Northwestern, Notre Dame and LSU with more certainly on the way. Breakout performer may be a ridiculous understatement as Gugliuzza led Lincoln-Way West in four statistical categories last season. The success from last season led to a tryout with team USA’s U17 squad and I would guess a lot of offers incoming. Personally, I cannot think of any other player who has improved their stock in one senior season than Terrence Shannon. The Lincoln Park senior put together an incredible season and parlayed it into offer upon offer. Shannon will head to prep school for a season before eventually making the jump to D1 but there will be plenty of high majors waiting for his services. But Luke, what’s the difference between breakout player and most improved player? Well I’ll tell you. Breakout player is an underclassmen who has bust onto the scene while most improved is a senior who has made tremendous progress over their four years all culminating in a really nice senior year. It’s probably not the award THT had in mind when he started his senior year, but I like to think it’s worth something. If you don’t already know, I have been a staunch THT supporter this year and although Simeon didn’t reach their end goal, THT still had an incredible senior year. Playing with high expectations is one of the toughest things to do in sports, and not only did THT live up to the hype, but he went above and beyond what was expected of him throughout the entire year. Record breaking after record breaking performance. Harte started out the year with winning a state title in cross country, and finished the year winning two state titles in the 1600, and 3200, breaking 30 year old records in the process. Oh, did we mention she’s only a sophomore? If I had to pick a favorite state champion for this season, this would probably be it. The small 2A school from Gage Park has only been open since 2010. Against all odds though, the Sun Warriors rolled through teams with a lot more experience and resources to win a state title in class 2A. It really was an incredible story which you can relive right here. Consider this a culmination of two incredible years for Geneva. After losing their leading scorer and rebounder last season in Grace Loberg, Geneva just continued to win basketball games. With respect to Margret Whitley who is a tremendous player, where Geneva trived was not through one individual, but rather by spacing the floor with five legitimate scoring options making them extremely difficult to stop. What else is there to say about Maine West’s year? With this award, you have to consider relative expectations. 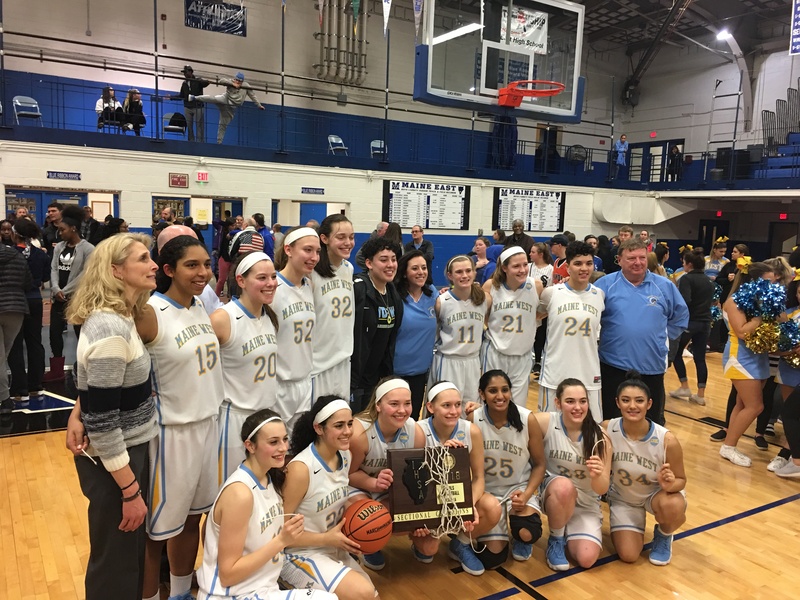 While New Trier may have had four teams playing in the state finals in a single day, I don’t think anybody was really surprised by their success, it’s what New Trier does year in and year out. The graduating crop of seniors have rewritten the record books for all thing Warriors athletics, and can look back an be extremely proud of all of their accomplishments this year.